Photo taken south of Tucson, Arizona, by John Gunn. From Wikipedia: The tiger rattlesnake is easily identified by its small, spade-shaped head, which is about 1/25 of its total body length. It has the smallest head of any rattlesnake, and a large rattle. The color pattern consists of a gray, lavender, blue-gray, pink, or buff ground color that usually turns to pink, pale orange, or cream on the sides. 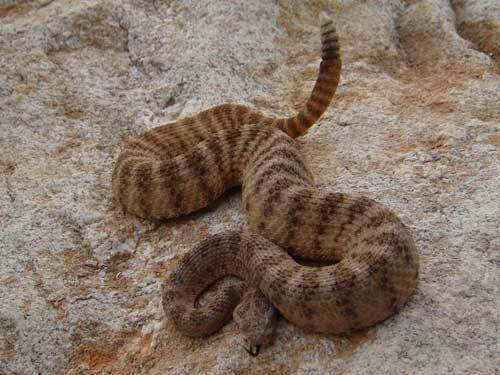 Tiger rattlesnakes are the only rattlesnake with crossbands on the anterior portion of their bodies, with a series of 35 to 52 gray, olive, or brown bands across the dorsum consisting mainly of heavy punctations.